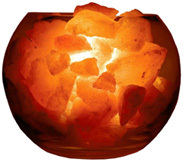 Himalayan Crystal Salt Lamp: Folioe Salt Lamps! Himalayan Salt Lamps are natural products and emit negative ions, negative ions create an atmosphere that promotes deep relaxation and calmness. Great for your home or office. • Ball: When you gaze at this salt ball, you’ll be mesmerized by its beauty while taking in the healing benefits of the negative ions it softly emits. Treatment area is about 49 square feet. Approximate Product Dimensions (each one is unique and may vary in size): H 4 to 5 inches, L 4 to 5 inches, W 4 to 5 inches. Weight is 12 to 5 lbs. ORDER TODAY! • Pyramid: Bring the classic shape of the Pyramid into your home or office! 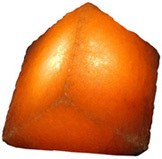 The pyramid shape is well known for its healing effects. Treatment area is about 49 square feet. Approximate Product Dimensions (each one is unique and may vary in size): H 5 to 7 inches, L 4 to 5 inches, W 4 to 5 inches. Weight is 3 to 5 lbs. ORDER TODAY! • Cube: Reminds you of a warm glowing solid block of soothing crystal light. Treatment area is about 49 square feet. Approximate Product Dimensions (each one is unique and may vary in size): H 4 to 5 inches, L 4 to 5 inches, W 4 to 5 inches. Weight is 4 to 6 lbs. ORDER TODAY! • Twisted Cube: Switch on your Twisted Cube and unwind! 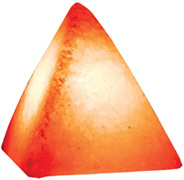 You’ll love to share about this interestingly shaped crystal salt lamp with your friends. Treatment area is about 49 square feet. Approximate Product Dimensions (each one is unique and may vary in size): H up to 5 inches, L up to 5 inches, W up to 5 inches. Weight is up to 5 lbs. ORDER TODAY! • Cylinder: You’ll forget about candles when you decorate with bold shape that produces such soft lighting effects. Treatment area is about 49 square feet. Approximate Product Dimensions (each one is unique and may vary in size): H 5 to 7 inches, L 3 to 4 inches, W 3 to 4 inches. Weight is 3 to 5 lbs. ORDER TODAY! • Tear Salt: Like a droplet of water frozen in time, our new teardrop shaped Crystal Salt Lamp will dazzle you with a constant flow of negative ions. Treatment area is about 49 square feet. Approximate Product Dimensions (each one is unique and may vary in size): H 5 to 7 inches, L 4 to 5 inches, W 4 to 5 inches. Weight is 3 to 5 lbs. ORDER TODAY! All lamps come complete with six foot UL electric cord, on/off switch and bulb. • Massage Stones Deluxe Set: The ancient healing art of stone massage is a modality for physical and spiritual balancing, Using various techniques incorporating warm and cold stones, the body is relaxed to its deepest. Can be warmed by microwave or by the Interactive Series lamps. 6 pc. ORDER TODAY! • Aroma Candle Holder: Are you stressed? Breathe deep! Add a few drops of lavender aromatherapy oil to your crystal salt aromatherapy burner. Includes: Crystal Salt Lamp base, tea light, polished chrome stand and glass diffusing plate for your favorite aroma oils (Aroma oils not included). Approximate Product Dimensions (each one is unique and may vary in size): H 6 to 8 inches, L 4 to 6 inches, W 4 to 6 inches. Weight is 4 to 6 lbs. ORDER TODAY! • Salt Candle Holder: When you light the tea light in the hand made Crystal Salt candle holder, you may feel like you’ve been transported back in time as the candle holder warms and releases the negative ions. Approximate Product Dimensions (each one is unique and may vary in size): H 4 to 6 inches, L 4 to 6 inches, W 4 to 6 inches. Weight is 4 to 6 lbs. ORDER TODAY! • Mini Salt Candle Holder: What a great little gift to give or keep for yourself! You’ll find many perfect little places for these Mini Candle Holders Perfect for a romantic dinner setting. Approximate Product Dimensions (each one is unique and may vary in size): H up to 3 inches, L up to 5 inches, W up to 5 inches. ORDER TODAY! Massage Stones Deluxe Set, 6 pc. 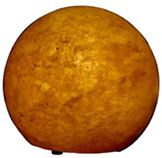 • Mini Moon Light: Produces important negative ions and creates a balanced environment for your health and well-being! The Mini Moon Light is perfect next to baby's bed, or in any smaller room. You'll also appreciate the soft glow it produces as a night-light. Makes a perfect baby shower gift, too! Treatment area is about 36 square feet. Approximate Product Dimensions (each one is unique and may vary in size): H 4 to 6 inches, L 3 to 4 inches, W 3 to 4 inches. Weight is 1 to 3 lbs. ORDER TODAY! • Medium Lamp w/ Base: The perfect gift. Soft. Soothing. Our Small Crystal Salt Lamp is just the right size for a small bedroom. The lamp is also a soft night-light. Your child will wake up bright and cheerful! Perfect next to the computer in a small workspace counteracting the destructive rays from the computer screen. Treatment area is about 64 square feet. Approximate Product Dimensions (each one is unique and may vary in size & weight). ORDER TODAY! • Small Lamp w/ Base: The perfect gift. Soft. Soothing. 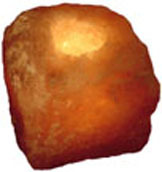 Our Small Crystal Salt Lamp is just the right size for a small bedroom. The lamp is also a soft night-light. Your child will wake up bright and cheerful! Perfect next to the computer in a small workspace counteracting the destructive rays from the computer screen. Treatment area is about 64 square feet. Approximate Product Dimensions (each one is unique and may vary in size & weight): H 7 to 9 inches, L 4 to 5 inches, W 4 to 5 inches. Weight is 6 to 10 lbs. ORDER TODAY! • Moon Light Medium Lamp w/ Base: When you place the Medium Crystal Salt Lamp in your office, helps diminish every day pressures! You’ll feel vibrant and refreshed. Place it in the bedroom to set a romantic mood.It’s great gift for you boss or co-workers, too. Slate base included. Treatment area is about 144 square feet. Approximate Product Dimensions (each one is unique and may vary in size & weight): H 9 to 12 inches, L 4 to 7 inches, W 4 to 7 inches. Weight is 12 to 20 lbs. ORDER TODAY! • Grande Decor Lamp: Your family and guests will be in awe of this wonderful piece of décor. The soft glow will settle them into a state of relaxation, harmony and balance. Perfect for a large room suite or office. Medical professionals enjoy the calming effect it has on patients. Slate base included. Treatment area is about 225 square feet. Approximate Product Dimensions (each one is unique and may vary in size & weight). ORDER TODAY! • Large Lamp w/ Base: Your family and guests will be in awe of this wonderful piece of décor. The soft glow will settle them into a state of relaxation, harmony and balance. Perfect for a large room suite or office. Medical professionals enjoy the calming effect it has on patients. Slate base included. Treatment area is about 225 square feet. Approximate Product Dimensions (each one is unique and may vary in size & weight): H 12 to 14 inches, L 6 to 9 inches, W 6 to 9 inches. Weight is 22 to 40 lbs. ORDER TODAY! Mini Moon Light, 1-3 lbs. | Mini Moon Light WHITE, 1-3 lbs..
CANDLES: Aroma Therapy Series: Small Lamp w/ Base, 6-10 lbs. CANDLES: Aroma Therapy Series: Moon Light, 12-20 lbs. CANDLES: Aroma Therapy Series: Large Lamp w/ Base, 22-40 lbs. • Glass Cubical Vase:ORDER TODAY! • Basket: Bask in the warm light and feel-good negative ions that emit from the crystal salt rocks, like fairies glowing in a lovely filigree Basket! Approximate Product Dimensions (each one is unique and may vary in size & weight): H 12 to 13 inches, L 7 to 8 inches, W 7 to 8 inches. Weight is 10 to 15 lbs. ORDER TODAY! • Treasure Chest: You’ll be delighted when you place the Treasure Chest on a table among plants or pictures of your loved ones! 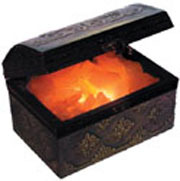 Beautiful, glowing, salt crystals fill the chest like golden treasure. Product Dimensions (each one is unique and may vary in size & weight). ORDER TODAY!